The first presidential election in which I was old enough to cast a vote was in 1948. I had turned 22 in April of that year, and I voted for Harry S. Truman. Later in my life I compared that to the date when my mother first voted in a presidential election. Women finally were allowed to vote in August 1920, a few weeks before my mother turned 21. She was also 22 when she first voted for a president. The difference was that she was a lifelong Republican and I have been a lifelong Democrat. I don’t remember why I chose to become a Democrat — during all of my childhood I had thought that Franklin D. Roosevelt was our president for life. He was elected when I was in kindergarten and served until I was in college. When he died unexpectedly, everyone was appalled to think that Harry Truman could manage running the country — but he did. I never got interested in politics. I went right into being a stay-at-home mom and motherhood after three years of college. Later I became disillusioned with men in power, and life on the Vineyard seemed so peaceful compared to the rest of the world. I will always remember Truman’s motto: “The buck stops here.” Much has changed in the political world since the days of Harry Truman, and I had become disillusioned by the amount of money that seemed to be needed to get elected to almost any national public office, and what happened to a man after he spent it all to be elected. Until last Saturday, that is. I usually turn on CNN briefly while I eat breakfast just to make sure the world is still out there. It is often the same news I heard before I went to bed. And often I get the feeling that nothing is going on in the world except what is happening in Washington, D.C. Sometimes we hear a breaking story but never hear how it ended. 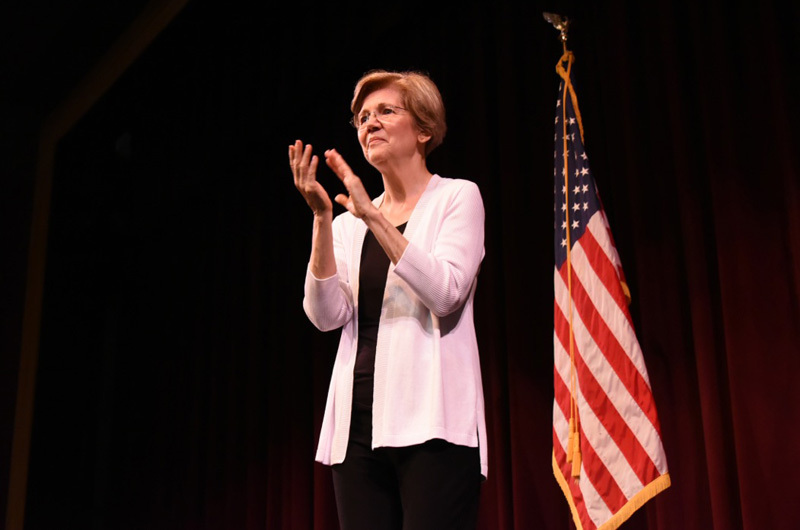 Occasionally I will get a glimpse of Elizabeth Warren who is speaking passionately about some serious problem that I am also worrying about. I am always impressed by her honesty in speaking what she feels. One knows she doesn’t depend on (fake) polls to guide her opinions. So I was surprised to hear that she was planning a town meeting type of visit to the Vineyard — not a fundraiser? Free to all? In a hall that holds 800 people? I was tempted but had to get over several hurdles before I would attempt such an outing. First, it was a morning meeting at the Performing Arts Center — her talk was scheduled for 10:30 a.m. and doors opened at 9:30 a.m. I would have to get up at 7 a.m. to eat breakfast, have a cup of coffee to help me along, get properly dressed (no more hanging out in nightie and robe all day, which I sometimes do when I’m not expecting company or an outing somewhere). When I turned 90 in 2016 I decided that I could eat whatever I wanted and do whatever I wanted to do. What I can’t do is walk very well or stand in a line for anything. So I tend to go early to wherever I’m going. Deborah, my daughter and caregiver, was ready and off we went at 9 a.m., knowing it might be a crowded affair (I don’t like to mix in a crowd as I’m pretty easily unbalanced). When we arrived at the high school at 9:15 a.m., we were astonished to see a long line of people that stretched out to the Vineyard Haven-Edgartown Road. Deborah let me out by the locked doors while she searched for a parking place in the large parking lot. I sat on my rollator to wait for her. Earlier in the week, a friend had pulled some strings and notified the powers that be that her disabled friend would need help in getting into the theatre. Thanks to Susanna, I was among the first to enter when the doors opened, and we were led to the front of the theatre where we got third-row aisle seats. We had each brought a book to read while we waited an hour for Warren to appear. I was impressed when I saw how the crowd was being handled — a few at a time were let in and directed to the empty seats near the stage. Thus the hall filled up in an orderly manner, and the balcony wasn’t opened until the amphitheatre seats were all filled. By 10 a.m., all 800 seats were filled. Another 200 people were crowded into the lobby and there was still a line of people outside. I was thrilled. I was excited. I was so glad I had forced myself out of bed early. As I near the end of my life, I am grateful to have witnessed a really wonderful politician. It has become one of the highlights of my life. 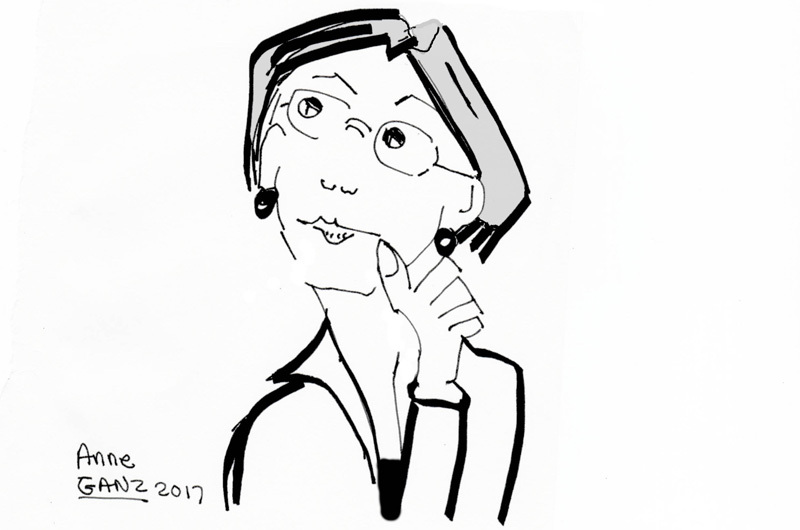 Gazette contributor Shirley W. Mayhew lives in West Tisbury. I brought a friend who is handicapped to see Elizabeth Warren and was very impressed with the expediency with which she was assisted into the building. Also very impressed with Senator Warren's presentation. About Harry Truman: my parents were ultra-right wing and Dewey supporters so imagine my shock to hear grade school friends chanting, "If you vote for Dewey, you're screwy! If you vote for Truman, you're human!" Perhaps the first tentative persuasive steps to turn me into a life-long Democratic Socialist. Nice story, Shirley! I was born in '48, also to a family of Republicans, and have been a lifelong Democrat since first registering in 1969. I'd been on Public Square as a twelve year old to see and hear JFK and my future was imprinted from that day forward. Elizabeth Warren strikes me the same way JFK did long ago. I hope we'll both be voting for her soon, but should I be fortunate enough to live to 90, it's unlikely I'll ever be able to write as well as you have here. Ms. Mayhew, you are an inspiration! It is time for this good woman to be in charge, have the buck stop with her, and chase that gang of hooligans back to Miralago. Oh, and she is tough as a boot!!!! Wonderful article, Shirley! In the ugly chaos of politics today it is good to know there is hope for the future. At one time Elizabeth Warren supported Ben Carson. Then she flipped. When the national base went after Carson she voted against his nomination. I like Carson. I wish Senator Warren would have voted her conscience.